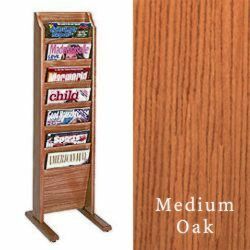 This 7-pocket booklet stand is crafted from solid golden oak with a medium finish that makes an eye-catching presentation in an office or lobby. 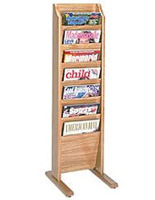 This magazine rack requires no assembly except for attaching the feet with a screw driver. 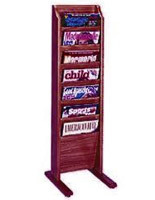 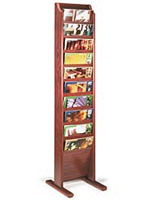 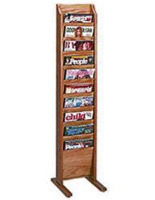 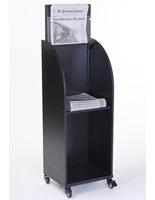 This 7-pocket booklet stand that is a freestanding wooden literature kiosk features angled slots so that the titles of the contents are easy to spot from a distance. 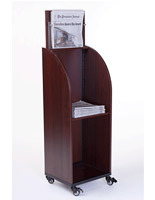 Order this publications display with same-day shipping if ordered before 1 p.m. during the week. 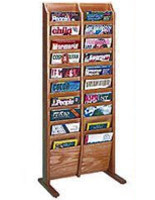 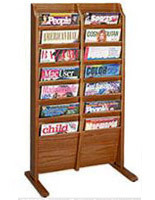 This 7-pocket booklet stand, also known as a leaflet holders system, fits 9" wide by 3/4" deep pamphlets on one side of the fixture.